Building a bridge takes a real feat of engineering and requires considerable knowledge of physics. It is also a feat of paperwork since bridges are public property and are subject to the same regulations as all public works projects. This means a lot of surety bonds – bid bonds for the application and after that the usual – performance and payment bonds, supply bonds and subdivision bonds. Finally, all subsequent repairs and renovations require site improvement bonds. And there could be a lot of these since a recent survey found that thousands of bridges across the country are in a poor state and may present serious hazards. But bridges are also beautiful works of art that are aesthetically pleasing and stand as monuments to something larger than life. Let’s examine 5 outstanding examples. The New River Gorge Bridge, located close to Fayetville, West Virginia, not only has breathtaking views, it is also the third highest bridge (among those intended for vehicles) in the US and the fifth highest in the world. 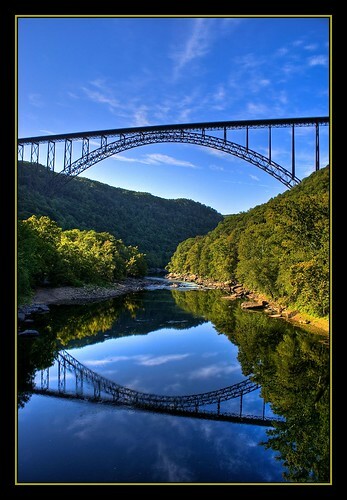 Spanning over 3,030 feet, it is also the fourth longest single-span steel arch bridge in the world. Costing $37 million, it was finished in 1977, made from weathering steel (also known as COR-TEN), a robust steel alloy that needs no paint and can endure harsh weather conditions for years on end and needs little maintenance. The New River Gorge Bridge is depicted on West Virginia’s state quarter (coin). The Golden Gate Bridge represents San Francisco like nothing else. The city’s iconic bridge was constructed in 1937 to link the city with the northern part of the peninsula as a way to galvanize its economy. The initial project proposal was for $100 million, a sum that was considered exorbitant in 1916. A year later, an engineer, a visionary and a poet by the name of Joseph Strauss made a proposal for the more modest amount of $17 million. Even this met with ardent opposition. It took him 8 years to convince the Board of Supervisors that the bridge was a viable investment. Construction took 4 years and was executed within budget. 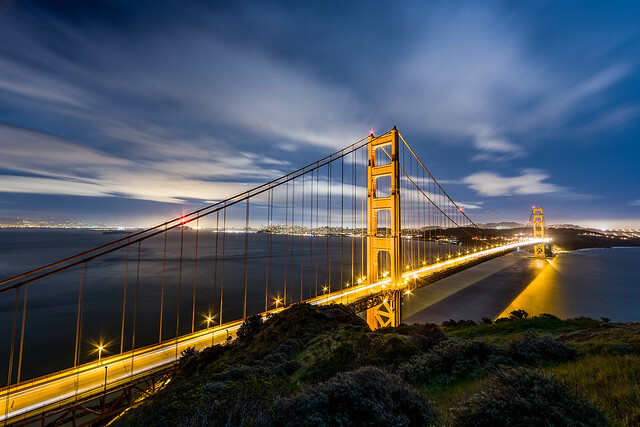 Today, the Golden Gate Bridge is part of the Modern Wonders of the World. 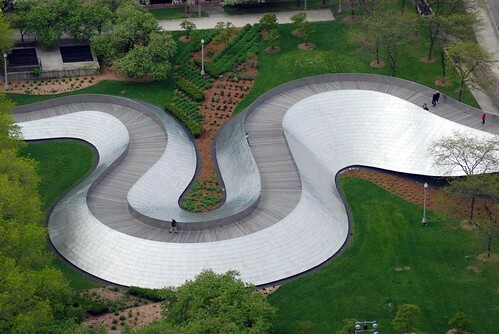 The BP Bridge is a 935-feet-long pedestrian bridge in Chicago’s Grant Park. The bridge was so-named because BP was the biggest donor to the project designed by popular Canadian-American architect Frank Gehry. Built from stainless steel, concrete and hardwood, the BP bridge was not only built for its aesthetics (it resembles a snake when seen from above), but to act as a berm noise barrier. It runs above Columbus Drive, a busy eight-lane Chicago boulevard, and makes the park a much quieter place. Construction took 2 years and cost $60 million. The Leonard P. Zakim Bunker Hill Memorial Bridge, situated on the northern exit from Boston, is a cable-stayed bridge. It was opened in 2003 as a replacement for the Charlestown High Bridge that was in place for over 50 years. It was funded as part of the Big Dig highway construction project that aimed to alleviate traffic in Boston. Just 10 years later, it is recognized as one of the symbols of the city. The bridge was named after Leonard P. Zakim, a civil rights activist from Boston. A year before it was opened for traffic, 14 elephants, totaling 112,000 pounds, crossed the bridge to demonstrate its stability. 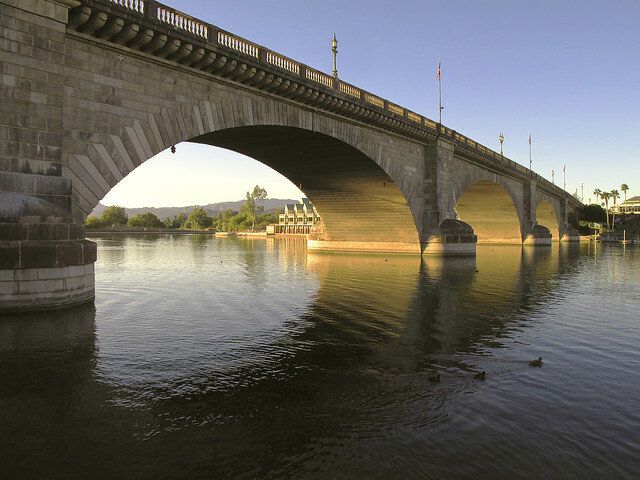 Contrary to what you might expect, this bridge isn’t in London but in the small Lake Havasu City in Arizona, though it resided in London for quite some time. It was built over the River Thames in 1831, back when there were no motor vehicles. As cars became more ubiquitous in London, the bridge became too small to accommodate its needs, so the city decided to sell it. Yes, sell it. Oddly enough, it was purchased by Robert McCulloch – entrepreneur and founder of Lake Havasu City. It took three years to move the whole bridge to its new location, but it was well worth the investment as it spurred interest in the city. Would anyone who has been a component with the program from the beginning mind sending me copies in the prior letters? I am signed up now but unfortunately did not hear of this until now. Many, many many thanks in advance. Everybody recognizes them as “[url=http://www.watchesclubs.com/]rolex replica[/url]”, they can be so lovable and pleasant that while I reside in Florida – I don them !!!! They can be just wonderful. To this point I am experiencing these dr dre headphones. They’re lovable and are ideal for a dr dre headphones person like me. I’ll update you following yr if the curling does transpire. So, much, just like the boots a whole lot! These dr dre headphones are Best, or for someone who just desires for being nice. hardly ever fall short to maintain your toes an excellent your calfs manner 🙂 i might advocate these dr dre headphones! Hi there, of course this paragraph is truly pleasant and I have learned lot of things from it about blogging. thanks. This post about Web optimization is truly nice one, and the back links are really very helpful to promote your web page, its also known as Search engine optimization. i can hardly resist mongolian sheep so i purchased these monster beats headphones !! obvi!!! they can be so low cost and remarkable along with the best piece is that they assist a foriegn economic system!!! any time you acquire these mongolians financial gain!!! which could enable them to invest in households, ! these boots can be a great vogue alternative!! They’re perfectly created and very at ease. I tried beats studio on plus they seem terrific!No regrets with this acquire! I’d to put on a trend demonstrate at get the job done!! !All people loves dre beats!!! ! Searching superior! Just enjoy the weather forecast, they are so lovable! My family every time say that I am wasting my time here at web, except I know I am getting know-how everyday by reading such pleasant articles or reviews. I love my beats headphones!!! I had been hesitant about buying these but I’m SOOO satisfied I did. I love these beats headphones! I fell in really like when i un-wrapped them! I really like the many beats headphones ! I really like beats headphones and would SOOO highly recommend this to a pal! Ideal SHOE Ever before! JUST IN Love!!! !